I'm really not very fond of this picture, I look so scared and wooden! I really need to work out a way to look a bit happier in my blog photos! This is an outfit I wore to work last week, I took the picture before work which actually may explain why I look strange, as i'm tired! This is a cute little vintage shirt I got from a vintage fair a few weeks ago, and i've teamed it with my favourite Urban Outfitters belt and a plain black skater skirt...I look like a 60's receptionist! My job is going really well, and thanks to all of you who have signed up to the blogger program, i'm excited to be working with you all! It's quite hard to get used to getting up at 7.30am everyday but apart from that it's really good and i'm learning a lot! Today I had a massage which was amazing! It was a proper holistic massage because my back has been really bad since starting my new job but I feel so much better since having that! Afterwards I went to a jumble sale with a friend and am just getting ready to go out tonight so apologies for this short post! 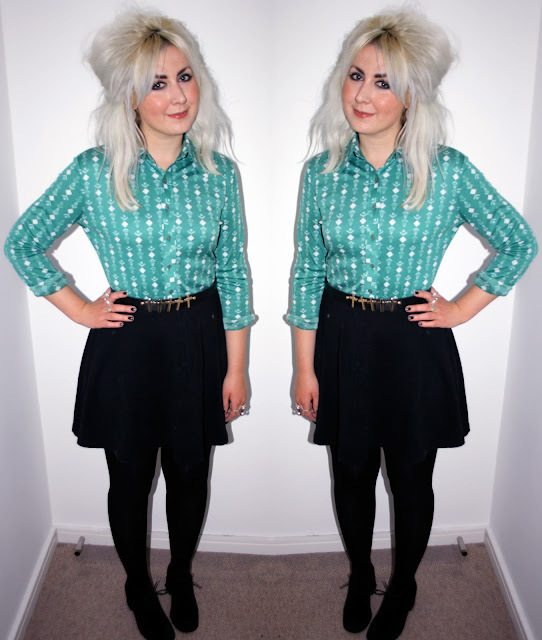 Love this shirt, the colour is fab on you! Amazing shirt! I love your style!